How to watch BoJack Horseman Christmas Special: Sabrina's Christmas Wish (2014) on Netflix United Kingdom! Yes, BoJack Horseman Christmas Special: Sabrina's Christmas Wish is now available on British Netflix. It arrived for online streaming on October 3, 2017. We'll keep checking Netflix United Kingdom for BoJack Horseman Christmas Special: Sabrina's Christmas Wish, and this page will be updated with any changes. 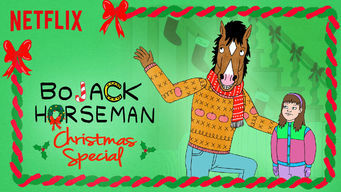 It's Christmas, and BoJack wants nothing to do with it. Then Todd shows up with a giant candy cane and an old "Horsin' Around" Christmas episode. Christmas episodes? BoJack Horseman doesn't give a $#! * about Christmas episodes ... or so he claims.